Sensory play in the Early Years Foundation Stage (EYFS) is an essential part of a child’s development. Sensory products are fascinating for all young children and can also be used very effectively to stimulate interest and interaction in children with special educational needs. Remote controlled Sensory Mood Lights add atmosphere to dark dens or reading corners and can be used as seats, tables or even as a light source for light panel-type activities. 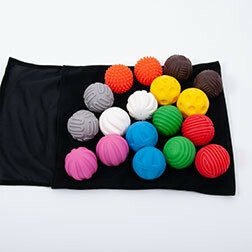 Our range of sensory ball sets involves the senses by being tactile, colourful, textured, shiny or bouncy – ideal for encouraging children to express themselves using descriptive language. 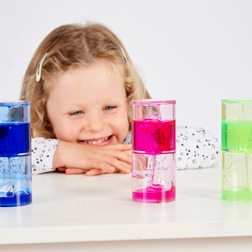 The sensory liquid sets are a captivating range of sensory resources which consist of tough plastic shaped tubes containing colourful oils in a water-based solution – the oils drop slowly through a range of obstacles, creating beautiful patterns which are mesmerising to watch. ClearView Magnifying Sand Timer Set - 1/3/5 Min.